This Presidents Day long weekend brings some welcome snowfall to the mountains here in Whistler. 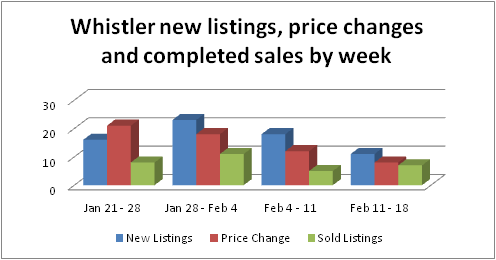 This past week the Whistler real estate market saw reductions in new listings and price reductions and an increase in completed sales compared to the week before. This past week saw 11 new listings, 8 Price changes and 7 sales. We had 3 chalets sales ranging from $350,000 to $1.6m, 1 Townhome sell for $580,000 and 3 condominium sales from $105,000 to $326,000. Please visit my weekly update page to view these properties. The number of active listings for single family homes, condos, duplexes, townhomes and vacant land is currently at 541 for Whistler as reported by the Whistler Listings System.